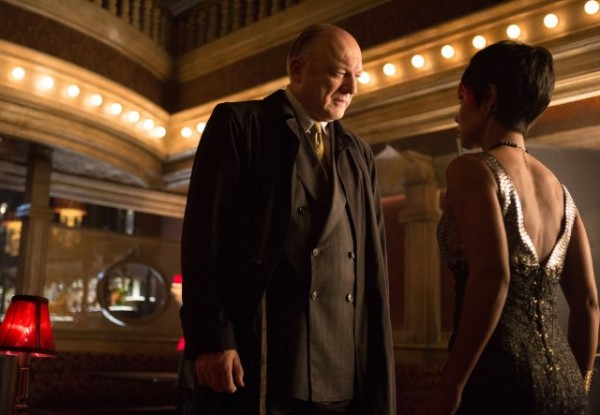 If you’re a fan of Selina Kyle, Bruce Wayne, or Alfred, then this isn’t the episode for you. All three are conspicuous by their absence, and to be honest the episode benefits from a tighter focus. There is a short scene with Barbara, which feels like filler (but probably isn’t). Otherwise, not a moment of the hour is wasted. The two main plotlines only briefly intersect – and perhaps not surprisingly, the Penguin is the common factor between the two. Jim pushes the Commissioner into giving him time to capture the escapees from Arkham Asylum, and Harvey isn’t best pleased to be caught up in his plans. This leads to some nice scenes in the precinct, since Jim’s plan involves using Maroni as bait, and there is actually a laugh aloud moment towards the end of the episode, which is probably no bad thing given what follows.